On October 19, 2017 at exactly 10:19 am, over 18 million people participated in The Great ShakeOut, a global earthquake preparedness event. The Great ShakeOut is an opportunity to learn and practice what to do before, during, and after an earthquake. 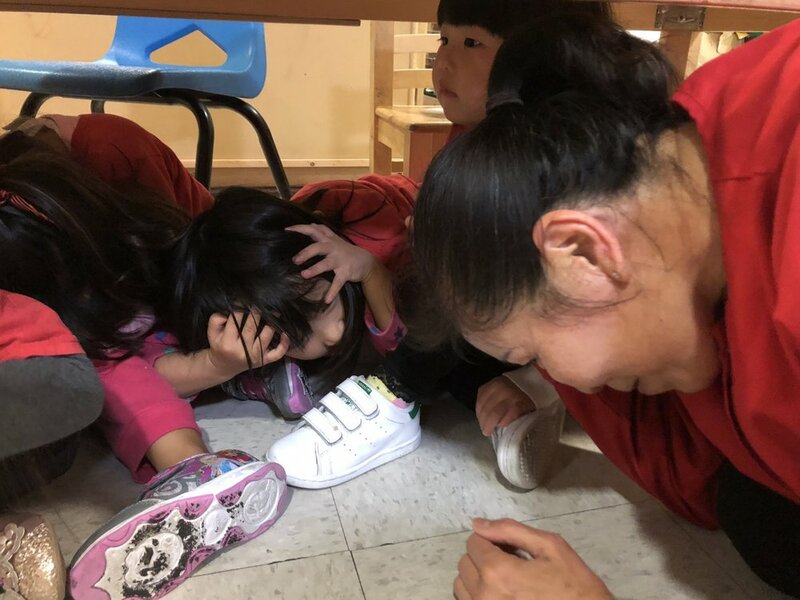 All Wu Yee Children's Services offices and Child Development Centers participated in the earthquake drill, which emphasized what Federal, state, and local emergency management experts and official preparedness organizations all agree on: “Drop, Cover, and Hold On". Cover your head and neck with one arm and hand, and stay on your knees bending over to protect vital organs. Hold on to shelter with one hand; be ready to move with your shelter if it shifts. If not under shelter, hold on to your head and neck with both arms and hands. So King Szeto, Family Advocate at Lok Yuen Child Development Center said all Wu Yee Child Development Centers participate in monthly earthquake and fire drills, so most children are familiar with the procedure. "Some of them understand the seriousness, but the little ones may need a teacher to help them out", she said.